Passerby engage in conversation at a "pop-up dialogue" event about public art at UIC. 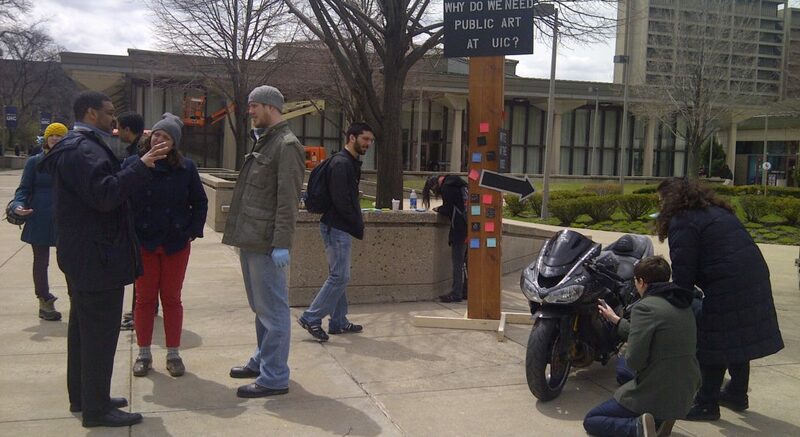 Participants were able to document their ideas by writing them on a motorcycle. As an university institute, we seek to broaden and deepen the engagement of Chicago-area residents in public policy and community issues—particularly at the neighborhood, city, and county levels—through the use of dialogue and deliberative processes. A national and international dialogue and deliberation movement has been transforming democracy in cities around the world. And we aim to enhance this movement in Chicago. Our explorations of this movement focus on conversations with practitioners in the field, including individuals and organizations who lead or facilitate dialogue and deliberative processes in Chicago. We have learned that practitioners are engaged in a wide range of activities, including community-building dialogues and explorations, deliberative decision-making processes with citizen participation, collaborative organizing and action, and conflict transformation. However, we have also discovered that these efforts in Chicago tend to be isolated, lack a common language, and yet have tremendous potential for collective, long-term impact. We strive to strengthen this potential. IPCE supports events that facilitate public discourse on policy issues or the policy implications of university research. Events include public forums, dialogues, town hall meetings, and small conferences or workshops that are either open to the public or that target a specific audience, such as policy advocates; residents of a specific neighborhood; or a sub-population, such as seniors or youth. IPCE also designs and leads dialogue and deliberation processes in partnership with communities and other institutions. We utilize methods that fall into categories defined by the National Coalition for Dialogue and Deliberation. Those engagement streams are: exploration, conflict transformation, decision making and collaborative action. Dialogue and deliberation are dynamic processes which can be empathy-enhancing, relationship-changing, problem-solving, action-planning, organization-developing, community-building, conflict-resolving, skill developing, prejudice reducing, consciousness-raising, and more! The various models and methods that are used in our field often emphasize, strive for and obtain different outcomes. This method of engagement is best used when a group or community is muddled by a specific issue. It focuses on listening, openness, and fostering a respectful space to share values. Conflict Transformation is centered on building trust and sharing personal stories and is important when the relationships among a group or community are poor or not established. This method focuses on naming and framing issues, considering options and opinions, and brainstorming solutions. Decision Making is best employed when providing suggestions to governing bodies. Collaborative Action can span multiple communities or entities and uses dialogue and deliberation to generate ideas for community action. This engagement framework was developed by NCDD. This engagement framework was developed by the National Coalition for Dialogue and Deliberation.